Street View: 46 and 16 Suppl. Linda Green contacted me a while ago to ask if I was was interested in the information she had on the Hardy family. Yes, I certainly was and below you will find the text with the information she supplied in red and my additions in black. As you can imagine, I am most grateful to Linda for her willingness to share her family history and some of the pictures to go with it. The Hardy family went into the Playing Card business in the early 1770s, initially from the Old Bailey. This started with Henry Hardy, who purchased the Freedom of London through the Goldsmiths’ Company in 1766. The Land Tax records show Hardy from 1770 onwards on the east side of Old Bailey, just a few houses away from the corner with Ludgate Hill. Both his eldest sons, James and Henry, served apprenticeships, and achieved their Freedoms in 1794 and 1796 respectively. Henry senior died in 1789 and the business and the supervision of the apprenticeships was taken over by his wife Sarah Hardy. 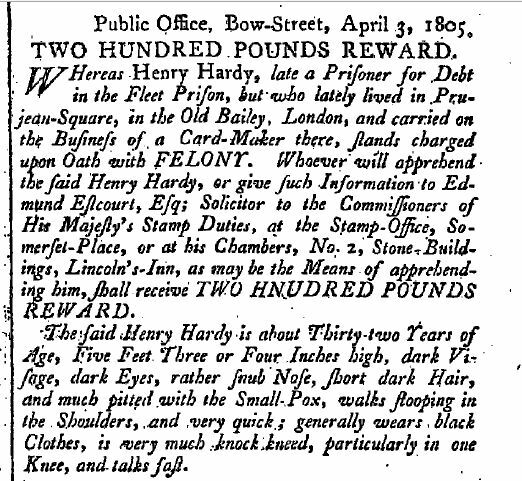 The business was plagued by bankruptcy, culminating in son Henry being admitted to the debtor’s prison from 1801, until 1804 when he absconded and a warrant was issued for his arrest for debts owed to ‘The King’, for fines and debts to various others. James Hardy then restarted the business in his own name, initially from the Minories, but moving to No 4 St. Paul’s Churchyard in the early years of the 19th century. In 1802-3 James was apparently a successful man, being master of the Worshipful Company of Makers of Playing Cards for that year. He was also a churchwarden at the church of St. Martin Ludgate, and had a family of his own. In January 1809 the Gentleman’s Magazine reported that there had been an extensive fire at the Hardy premises at No 4, which burned for three hours before it was subdued. In April 1809, James insured additional premises at 6 Little Carter Lane with the Sun Fire Offices and the Land Tax records show the building as being on the corner of Sermon Lane. The 1811 London and County Directory still have James at 4 St. Paul’s Churchyard, but the Land Tax records show that he had moved the following year to number 27 (late Robert Hedges). The family remained at number 27 until the early 1850s. Two of James’s sons, Henry and Edmund, were apprenticed to their father, in 1814 and 1817 respectively, for seven years, with the Goldsmiths’ Company. They both completed their apprenticeships and became Freemen of the City, Henry in 1821 and Edmund in 1824. In March 1825, James Hardy, Playing Card Maker & Copper Plate Printer of 27 St. Paul’s Churchyard, took out an insurance policy with the Sun Alliance on his ‘dwelling house’. The house & contents were valued at c. £6000 [“No cards made nor stove therein, Brick”]. Possessions listed included household goods and wearing apparel £1200, Jewels £300, Musical instruments therein £150, China & Glass therein £100, Stock and utensils and Goods in trust therein £2,500. A second policy was taken out for their ‘dwelling house & manufactury’ at 3 Little Trinity Lane, with building & contents £3,500. The policy was renewed in 1826. It was wise to take out insurance with such inflammable items as playing cards on the premises. Soon afterwards a large fire caused destruction of many houses in Marylebone, including the card manufactury there of ‘Hardy & Sons’. It is not know if that was insured also. 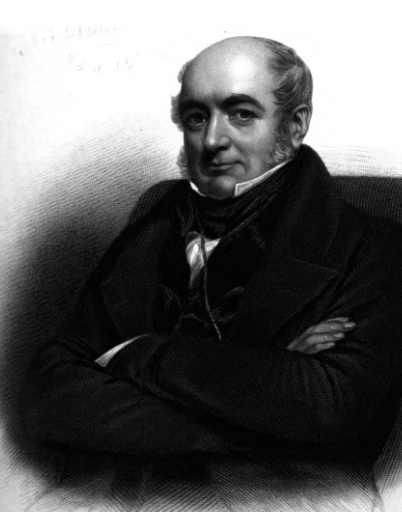 In 1831-2 James Hardy became [for the second time] Master of the Worshipful Company of Makers of Playing Cards. In January 1837 there was an assignment of interest in the business from James Hardy to his two eldest sons, Henry and Edmund Hardy [noted in family papers]. In December 1837 James Hardy died, described as ‘Gentleman, of St. Paul’s Churchyard’; he was buried at St. Martin Ludgate. Dated 1839, a Bond signed by Henry  & Edmund Hardy, of 27 St. Paul’s Churchyard & 3 Little Trinity Lane, ‘licensed card makers’ and James Hardy , stationer of 27 St. Paul’s Churchyard and Carter Draper, Solicitor, states that they are ‘to pay all duties and taxes demanded, the sum of £500, and one shilling for every Ace of Spades issued by the stamp office’. A Licence application had preceded this document. It states that Henry & Edmund will be carrying out the card making business [family papers]. The younger son of James [also James], was apparently not to be part of the business; he died in 1841. In the 1841 Census, Henry and Edmund are listed as resident at St. Paul’s Churchyard, Henry as ‘Cardmaker’. Other residents included Alice and Hannah Hardy [their sisters], Alice Houghton [an aunt] and two servants. In 1847 Henry Hardy, ‘Gentleman’ of St. Paul’s Churchyard, married Susan Morling. Family tradition is that he was disinherited for marrying the maid. She was certainly half his age, already living at the address and pregnant. In 1852 ‘Hardy’ is still listed in Kelly’s Directory at 27 St. Paul’s Churchyard, though family members were listed as living at different addresses in the 1851 Census. By 1853 they were no longer showing up in Watkin’s Directory, but were instead found in Upper Thames Street and Little Trinity Lane. In 1854 Henry Hardy, Playing Card Maker, died, by then resident at Kings Place, Commercial Rd East. His widow Susan Hardy petitioned the Goldsmith’s Company for financial assistance. By 1861 she was working as a ‘bootbinder’ in Southwark and their children were resident in the City of London’s workhouse school. I freely admit that I had no idea what a bootbinder was and first thought it was a mistake for bookbinder, but it turns out to have been someone who operated a machine which stitched the uppers of boot and shoes to the soles. You learn something new every day when doing historical research. By 1881 Susan was in Brookwood Asylum, moved from Newington Infirmary after suffering from delusions, and she stayed there until her death in 1895. Her son Henry married a woman who lived in St. Andrews Road, and became a painter/decorator with his own business. He had probably learned the trade in the Workhouse school. In 1895 he renewed his connection with the Goldsmiths’ Company so that he could apply for financial assistance when there were problems with his business. Edmund Hardy died in 1859, by then of Gibson Sq, Islington, Gentleman [the last of the Hardy card makers]. During 1867-71 his sister Hannah repeatedly petitioned the Goldsmiths’ Company for help, on the grounds that her money had all been used up to prop up the family business. She was eventually awarded a Goldsmiths’ pension. The card-making industry as a whole was experiencing difficulties by the middle of the nineteenth century, and many businesses closed down or were sold to bigger firms. The Hardy business is thought to have been sold to Reynolds. But another development may very well have triggered the move by the Hardys away from St. Paul’s Churchyard. 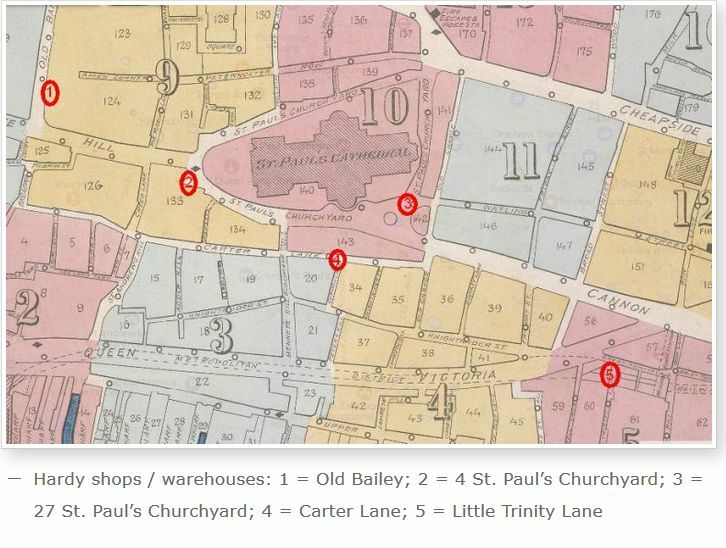 To alleviate the congestion in Cheapside, Cannon Street, which only used to stretch as far west as Walbrook, was extended in the 1850s from Walbrook to St. Paul’s Churchyard by clearing a wide section of small streets to the south-​​east of St. Paul’s. In the map below, you can see how the original curve of the houses (red line) followed the contours of the church to Watling Street. With the alterations, a whole triangle of houses in St. Paul’s Churchyard disappeared and where number 27 had once been, only road surface remained. The 1852 Land Tax records already showed quite a number of empty houses around number 27, and by 1853, 27 was empty as well. And that was the end of the card making business of the Hardys in St. Paul’s Churchyard. Street Views: 46 and 16 Suppl. 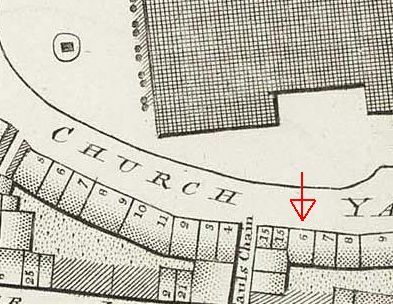 Tallis’s Street View of St. Paul’s Churchyard in his 1847 Supplement just shows a very large property as number 16, but his 1839 edition (see below) is nearer the mark as it distinguishes between numbers 15 and 16 and shows the name of Allsup (late Pallatt & Green). 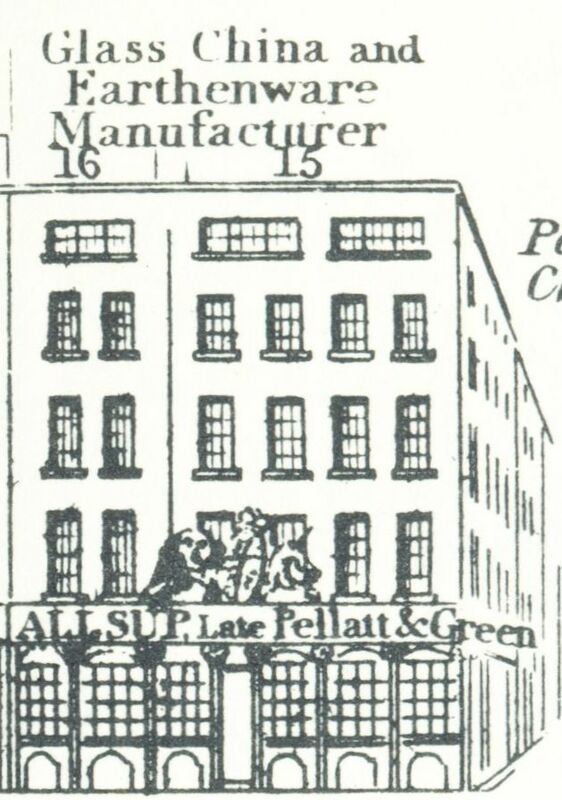 I do not know for certain, but I presume that Allsup had the show rooms on the lower floor for his glass and china business, while Toplis had the first floor, possibly just at number 16. 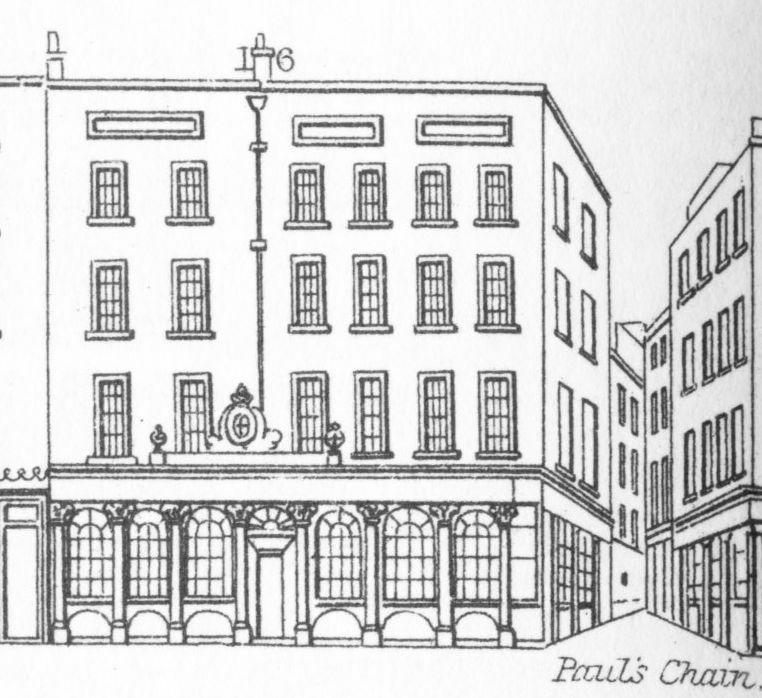 The premises were situated on the south side of St. Paul’s Cathedral, on the corner of Paul’s Chain, later renamed Goldiman Street. The row of houses east from Paul’s Chain have disappeared altogether and there is now a green space called Carter Gardens with the pavement in front of the triangular City of London information centre roughly where Toplis and Allsup had their businesses. The thieves are found guilty of trying to abscond with material belonging to Maynard and are sentenced to transportation for seven years, but that is not why I quoted Maynard’s testimony. He mentioned Mr. Toplis jun. which was James Toplis junior, who had been apprenticed to Thomas Stead, a surveyor, from 1816. 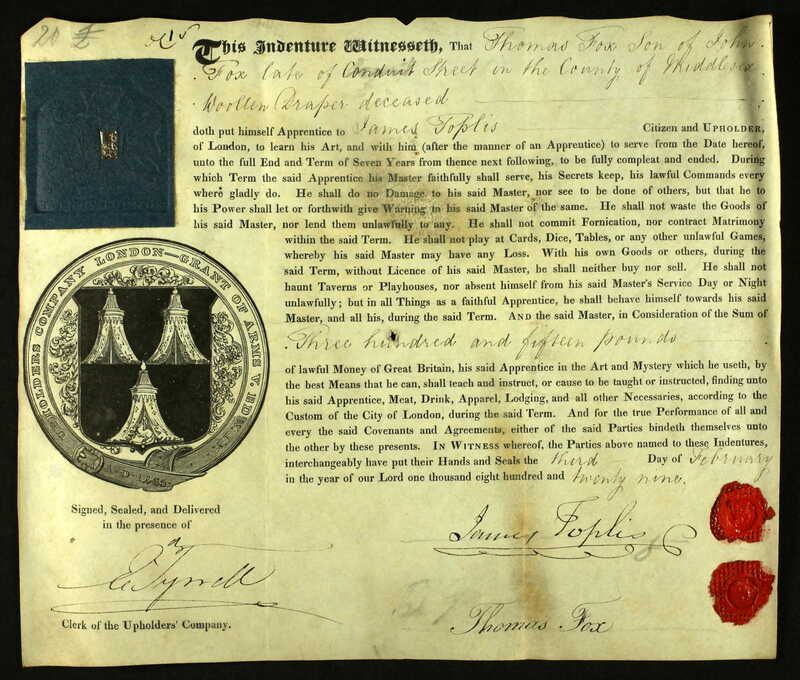 The indenture does not say so, but James obtained his freedom in 1823 after the customary seven years and went into business with his father. We know a little bit of the everyday running of the business, because Job Knight, a young furniture maker from Chelmsford, Essex, came to London to improve his situation and he started work for Toplis as draftsman and clerk. Knight left a diary for the year 1818 in which we can read that he was given all sorts of odd jobs to do, from collecting rent to helping out at the auctions, and from drawing furniture designs to helping in the upholstery workshop. (3) Only in the winter months, when the evenings were too dark to work, did Job have time to attend lectures, for instance at Guy’s Hospital or the London Philosophical Society. Eating and visiting friends or relatives were often combined activities. According to Heller, Job had the hour between 16.00 and 17.00 for his evening meal and he frequently spent that time at a friend’s or relative’s house. 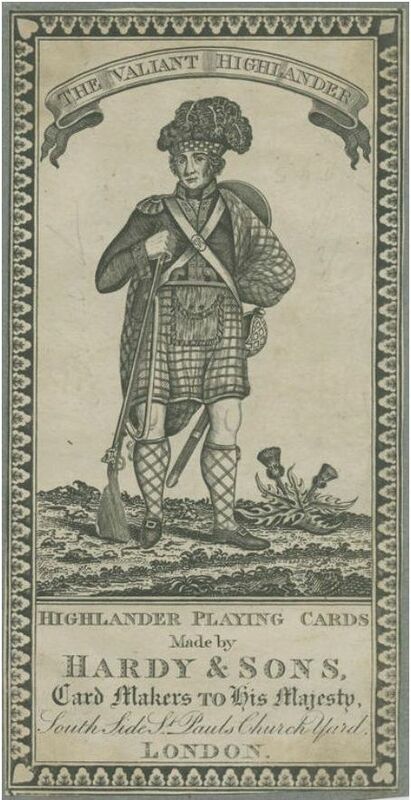 Knight died in 1819, just 30 years old. (4) Had he lived longer we might have learned a lot more about the everyday life of a young man trying to make his way as a cabinet maker. Another young man with his eye on the future was Thomas Fox who became apprenticed to the Toplis firm in 1829 (see his indenture above), but in stead of remaining with them, he married one of the daughters(5) and then went to work in Bishopsgate Street where he took over from Henry Luke Cooper who had had a similar sort of business. No hard feelings apparently within the family about this ‘desertion’ as Fox was named as one of executors in the wills of both father and son Toplis. But the firm did not just deal in houses, but also ran an ‘ordinary’ auction house. In May 1845, for instance, they organised the sale of “the remaining stock of a wine merchant, about 500 dozen wine, chiefly port and sherry, including small quantities of champagne, claret, & sparkling hock. Also 11 dozen pints Tokay, salvage from the marquis of Bute’s from Luton Hoo”. The Luton Hoo property had gone up in flames in November 1843 (see here), but was insured with the Sun Fire Office and various other companies, so perhaps Toplis had been involved in his capacity as surveyor and appraiser for one of the Fire companies and had managed to combine his skills as auctioneer and surveyor to make some money from the unhappy event. 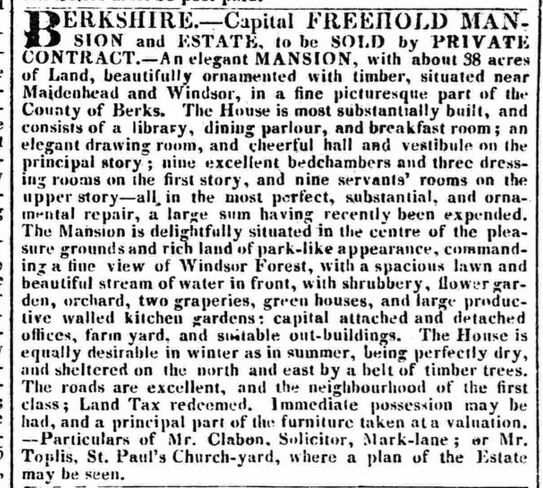 Advertisement in The Morning Chronicle, 19 February 1840. 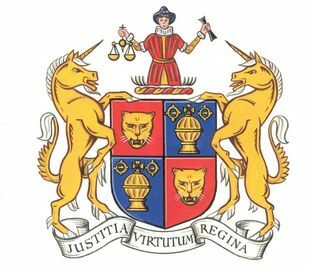 The Toplis company still exists, but nowadays as Toplis & Harding, who, on one of their their websites say that William Daniel Harding joined the firm in 1844. I have not seen any evidence of that, but it is quite possible, although perhaps not straight away as a partner. The earliest mention of the name ‘Toplis and Harding’ I found was for 1858. William Daniel obtained the freedom of the City in 1865 and his sons Edward Ernest and William Daniel junior in 1879. 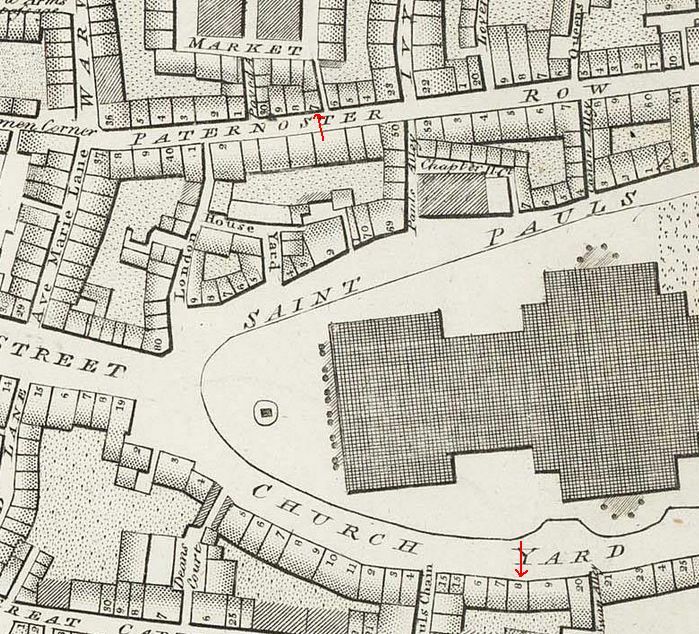 The address of 16 St. Paul’s Churchyard remained until at least 1886; afterwards they could be found at 80 St. Paul’s Churchyard. (1) Old Bailey case t18200918-2. (2) Old Bailey case t18310512-131. (3) B. Heller, Leisure and Pleasure in London Society, 1760-1820: an agent-centred approach, 2009. The original diary can be found in the Library of the Society of Friends, MS Vol S 485. (4) PROB 11/1613/389. Job must have been a thrifty man as his estate was valued at over £720. (5) Thomas Fox and Jane Toplis were married by licence at St. Ann Blackfriars on the thirty-first[!] day of September 1837. (6) Old Bailey case t18450407-905. (7) PROB 11/2224/25; and England & Wales, National Probate Calendar (Index of Wills and Administrations), 1861. On 22 February 1810, Edward Vernon Walford was born at Great Yarmouth, Norfolk, the son of William and Hephzibah Walford. His birth was recorded at the Dr. Williams’s Library, London. This may seem strange, but a lot of Nonconformist births were recorded there prior to the compulsory law requiring registration of births, marriages and deaths in 1836. (1) Edward Vernon’s father was a Congregational minister in Yarmouth from 1800-1813. He is often confused with a William W. Walford, apparently a blind shopkeeper from Coleshill, who was responsible for the lyrics of the hymn “Sweet Hour of Prayer”, but I do not think that these two men are one and the same person as is sometimes suggested. (2) After a spell at Homerton College as classics teacher, Walford senior became a minister at Uxbridge (see here for more information) and from Uxbridge, young Edward made his way to London to work in the book trade. 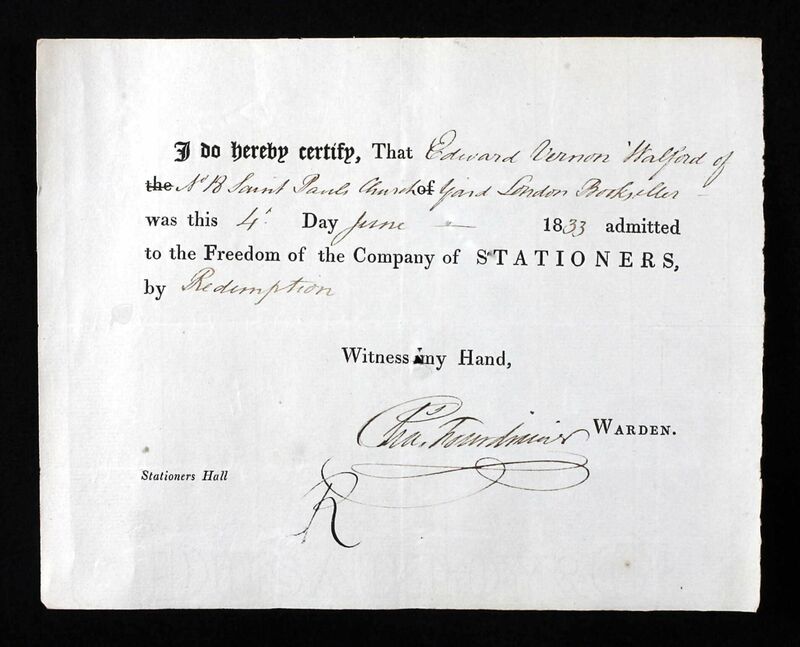 In 1833, Edward obtained the freedom of the Stationers’ Company by paying 46s 8d, that is, by redemption, suggesting that he had not gone through the usual 7-year apprenticeship. Walford’s father died in 1850 and in April of the following year, Jackson & Walford announced the publication of the reverend’s autobiography, edited by Congregational minister John Stoughton. In the book, Walford senior describes how he made a journey for his health to Harrogate in 1836. He and his wife were “expecting Edward, as soon as he can liberate himself from the fetters of St. Paul’s Churchyard, which, he tells us, is not likely to be in less than a fortnight or three weeks”. He also tells us that at some point – the reverend is not very good at giving exact dates – he, Edward, and “an active friend” set out for France, Switzerland, and Germany. Unfortunately, Edward and the unnamed friend had to be back in London for business, so the trip was done at great speed and the reverend “was hurried from scenes of surpassing grandeur and interest, before [he] had half gratified [him]self with gazing upon them”. Although in the last passage about the Continental trip Walford senior does not mention Edward by name, he just says “my son”, we know from an earlier remark that Edward was the only living child. There had been a younger brother, but he died aged only six months, and a sister who died from an accident when she was seventeen. In 1844, Jackson & Walford took on a young apprentice, originally from Staines. His name was Matthew Henry Hodder and he was to determine the future of the company. After his apprenticeship, Matthew stayed on as the – only – assistent and in 1861 he acquired a third share in the business for £6,335. From that moment onwards, the imprints read Jackson, Walford & Hodder. Jackson and Walford were old by that time and Hodder was looking for a new partner which he found in Thomas Wilberforce Stoughton, the eldest son of the John Stoughton who had edited the Autobiography of William Walford. In 1862, the premises of Thomas Ward & Co. at 27 Paternoster Row were bought and the two addresses were used simultaneously for a short period in early 1863, but quite quickly the whole business was located in Paternoster Row and from 16 June 1868, after the retirement of Jackson and Walford, the firm of Hodder & Stoughton was in business at that address and has remained one of the more important English publishers to the present day. If you want to know more about the history of Hodder & Stoughton, I recommend John Attenborough’s A Living Memory. Hodder and Stoughton Publishers 1868-1975 (1975), from which most of the information in this last paragraph is taken, or see the firm’s website. (1) Website of the library here. (2) See for instance website UMC Discipleship Ministries here. (3) The Bookseller, 1 July, 1868. (4) R.V. 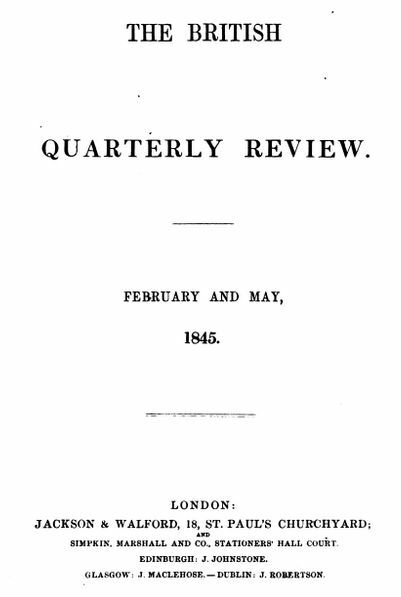 Osbourn, “The British Quarterly Review” in Review of English Studies, Vol. 1, April 1950, pp. 147-152. 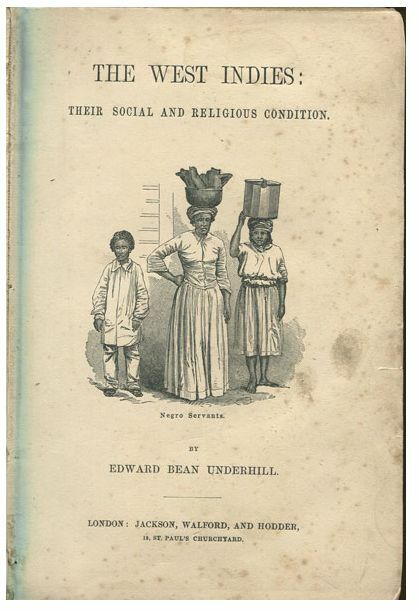 (5) Quite by chance, I chose this example of the works Jackson & Walford published and it turned out that the author married as his second wife Emily, the daughter of John Lee Benham, the ironmonger at Wigmore Street. Thanks go to Anne Gretton for pointing this link out to me (see comments to this post). Todd & Procter’s cheese shop was situated at no. 78 at the west end of St. Paul’s Churchyard; the elevation can be seen above on the left. 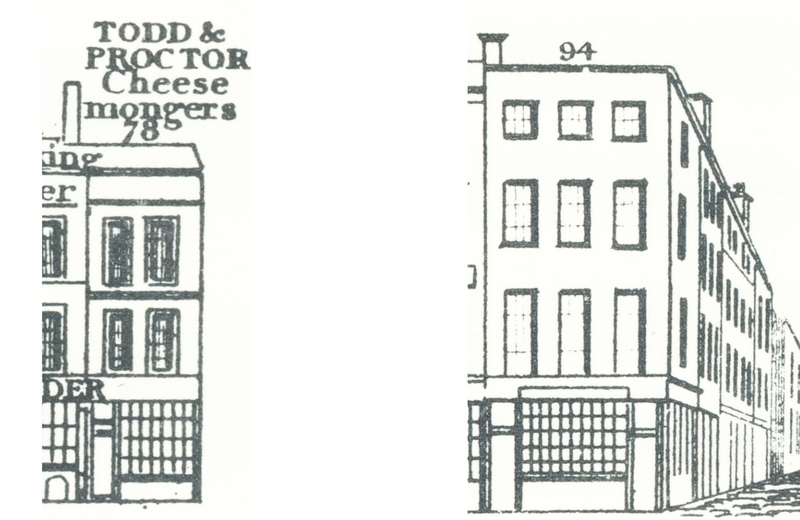 At 94 Tottenham Court Road, however, another cheesemonger named Procter could be found; see elevation on the right. Were they related? And if so, what did Todd have to do with them? It is going to be a long story, but bear with me, we’ll get there. On 15 August 1853, Todd and Procter appeared at the Old Bailey because one of their employees had embezzled some money. From this we learn their first names, John Todd and Robert Procter and that they are partners. When questioned about the number of staff, Todd says that their establishment has “eight or nine; some are employed behind the counter, and some in carrying out” James Crawley had been their porter for twelve years and was supposed to hand in the money to whoever was behind the counter when he came back from a delivery. Procter had his suspicions, as it turned out correctly, that Crawley was withholding money. When taken into custody and searched, he had some 300l. in betting slips in his pocket. Because of his previous good behaviour, he was confined for four months. The whole proceedings can be read here under number 832. In 1871, the London Gazette published a notice that the partnership between John Todd and Robert Procter had been dissolved and that Robert was to continue the business. 1851: Robert Procter (45), Mary, his wife (45), Robert, a son (8) Elizabeth, a daughter (4), and John, another son (2). So, John Todd lived above the shop in 1841, moved out when Robert was raising a family, but came back again as a pensioner. Assumedly, when he retired, the business was put in Procter’s name, hence the announcement in the London Gazette. I have found John Todd, cheesemonger, lodging at 52 Watling Street in the 1851 census. He dies 28 March 1879 and is then listed as “formerly of 78 St. Paul’s-Church-yard […] but late of 25 Landsdowne-road Dalston”. The will is proved by William Bowron of 60 Pimlico Road and William Procter of 94 Tottenham Court Road, nephews. (1) Here is our first proof that the two cheesemonger businesses are related. In 1851, John Procter is already living at 94 Tottenham Court, corner Howland Street, as cheesemonger with his sister Elisabeth and William Bowron, the nephew. Although I cannot find the 1841 entry in the census, I assume he was the Procter of the Tallis’ elevation. In 1861, the other nephew, William Procter, has joined John and Elisabeth, and so has one William Todd, most likely related to John Todd of St. Paul’s Churchyard. In 1871, John is retired and living with his sister and two servants at Brecknock Road. The shop at Tottenham Court Road is now solely in the hands of William Procter. William was born in Southwark and we find him in the 1841 census on the Kent Road with his father, also a cheesemonger and his mother Christian. In 1851, the family has moved to 4 Bentley Terrace, Hackney. His parents married at St. Pancras in 1831 and the register gives her last name as Todd, so no wonder William is the nephew who proved John Todd’s will. John and Christian Todd were the children of John and Elisabeth Todd of St. Gregory by St. Paul’s parish. 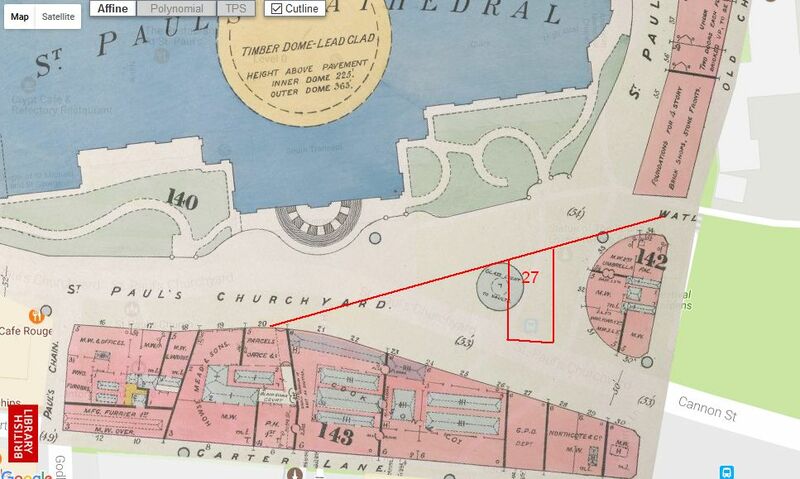 The records do not give an exact address, but is not unlikely to have been 78 St. Paul’s Churchyard. 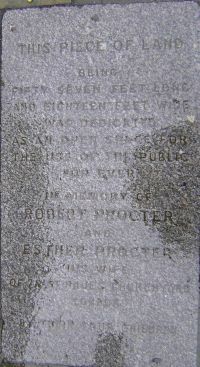 The monument shown consists of two parts: a plaque describing that the plot of land was to stay an open space in memory of Robert and Esther Procter, the 3rd generation, and a stretched pyramid commemorating John Procter and Mary Todd, the 1st generation. (4) The small open space with the monument is situated on the corner of Tottenham Court Road and Tottenham Street, just south of Whit(e)field’s Chapel (or Tabernacle), one block away from where the 94 Tottenham Court road shop was on the corner of Howland Street. And, if all this is not yet complicated enough, there may be another link between the families. On the censuses, John, Elisabeth, William sr. and Robert sr. all give their place of birth as Barnard Castle, Durham. Following that lead, I found the marriage of their parents in an online family tree. John Procter sr. and Mary Todd were married at Barningham, Yorks, on 27 July 1793. I have not been able to find proof that these are indeed the parents of the cheesemongers, but see no reason to doubt it. 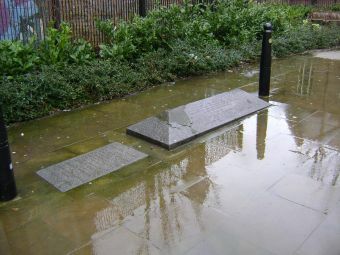 The names and dates of John and Mary certainly correspond to the ones on the monument that can be found in Tottenham Court Road for some of the family members, incidentally confirming that John Procter senior was already established in 94 Tottenham Court Road at the time of his death in 1834. What is uncertain is whether Mary Todd and John Todd sr. were siblings and so providing a double family link, but what is definitely certain is that the Todds and Procters became one large cheesemongering family with several shops in London. To make it a bit clearer – I hope – a chart with the main protagonists (just click to enlarge it). I have left out family members who do not figure in the story above. The year of birth given in the chart may be an approximate one. (4) A transcription of the text on the monument and more information on the site where the monument now stands, can be found on the website of London Remembers. You may also like to read about the Aldersons, who also came from the Barnard Castle area.